The picturesque beauty of the town and surrounding oak and pine covered hills are interrupted by the presence of the severe, grinding poverty afflicting many local farmers and their families. Cuquio, Jalisco, is a small rural farming pueblo (town) located approximately 70 miles northeast of Guadalajara in the high mountains. 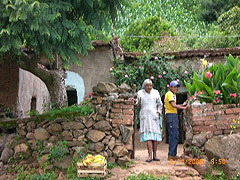 There are 124 smaller ranchos (villages) associated with Cuquio in the outlying areas of the countryside. Children in the region are especially adversely affected. Many experience mal- and under-nutrition with few educational opportunities that can end the cycle of poverty in their families. The campesinos living in one of the most remote villages near Cuquio enjoy some of the most spectacular scenery in Mexico. They live on the edge of a deep gorge that defines the boundary between the state of Zacatecas and Jalisco. The green hillsides of summer, sprinkled here and there with a milpa, are truly a site to behold. Fifty-eight year old José Palafox is the village representative, and he and his family have continued the cultivation of a pristine milpa of uncontaminated maíz criollo next to their home for generations. 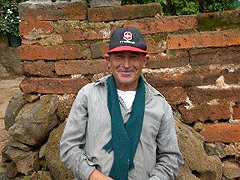 José claims that his village is so remote that no agrochemical or GMO seed representatives have ever visited the village. Since there are no nearby villages, and the gorge acts as a formidable barrier for the entrance of foreign corn pollen into the village, he claims that the village corn is pure. The Center for Farmworker Families has brought back some of his delicious, nutritionally-rich corn to distribute to members of a Community Supported Agriculture project in San José. Those of you who have read The Farmworkers’ Journey are well aware of the impact that NAFTA and so-called “Green Revolution” technologies have had on the rural countryside. Many corn farmers have been forced by NAFTA to flee their lands in order to avert starvation. Those who stay behind with their families often find their lands unproductive after years of growing imported seed with the required agrochemicals. There is a growing interest among local farmers in organic sustainable crop production. Dr. López has suggested the possibility of developing a Community Supported Agriculture program that would serve the needs of the growing number of Guadalajara consumers who are looking for and demanding organic produce. Such a venture would provide farmers with much-needed income and allow them to avoid the unwelcome prospect of immigration. A recent graduate of UCSC's Center for Agroecology and Sustainable Food Systems (CASFS) six-month apprenticeship program has expressed an interest in working with the farmers in Cuquio to develop organic production and a CSA with Guadalajara. Dr. López met with a group of women that have formed an organic cooperative entitled Cooperativa Mujeres Campesinas en Acción. Their goal is to grow “clean” food for their families while protecting the water systems of the area and other aspects of the ecology. Rosa Hilda Rodriguez is the group’s leader (see photo below). The cooperative owns approximately seven ha. (17 acres) among its members. Along with the unemployed corn farmers introduced above, Rosa’s group is very interested in starting a Community Supported Agriculture program with Guadalajara. 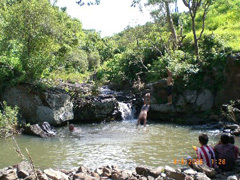 To reinforce local government support for this venture, a local councilman has offered to lend 10 hectares of his pristine land for the purpose of bringing organic agriculture to the Cuquio countryside. A promising new development in Cuquio is the sale of certified organic fertilizer (see photo above). With the increase in oil prices worldwide, agrochemical fertilizers, pesticides and herbicides that are oil-based have become prohibitively expensive. Organic alternatives are thus in demand as a less expensive alternative. Dr. López is currently meeting with local Santa Cruz farmers who have sustainable agriculture farming experience and have managed CSAs in California. The Center’s goal is to bring an experienced farmer to Cuquio for an extended workshop in organic produce production and CSA development; to be attended by interested unemployed corn farmers. To stay updated, make sure you "like" us on facebook and join our mailing list! The rural countryside of west central Mexico during the rainy summer season is one of the most beautiful, picturesque natural landscapes on the planet. As a way of contributing to the economic viability of Cuquio while bringing joy and necessities to the people in Cuquio’s poorest, most remote villages, we host piñata parties. Many village children have never been to a traditional piñata party, nor have they had the opportunity to play with toys from a piñata or to taste a real cake made at a bakery. We now visit six of Cuquio’s poorest, most remote villages to offer the traditional piñata party experience to the residents while passing out dental supplies, shoes and other clothes, school supplies, and toys. 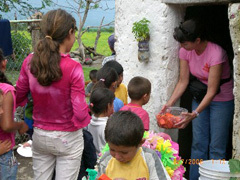 Villages visited include Los Sauces de Perez, Ojo de Agua Colorado, Rancho Nuevo, Varaz Dulces, Juchitlán, and Agua Blanca. 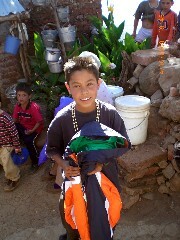 Expenses include the purchase of a piñata, piñata toys, candy, fruit, a cake, and shoes, clothes, school supplies, toys, and in some cases, medicines to combat parasites. The Michael Lee Environmental Foundation purchased a van to transport children to local schools in one of the most remote, impoverished villages near Cuquio, Jalisco; Rancho Nuevo. We successfully delivered the van from Santa Cruz, California to the village so that children can be transported to and attend local schools. A piñata full of toys and candy in the shape of a car was sent to the village in the van for a celebration. 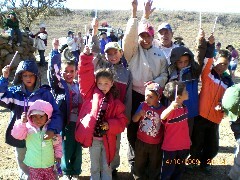 Village children were also provided with school supplies and books to begin their educational journey. Fifteen school-age children are now in school and attending regularly because of the Michael Lee Environmental Foundation’s generosity. 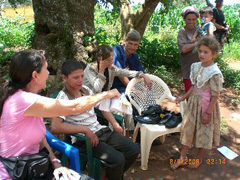 As of 2011, all residents of the remote Rancho Nuevo village near Cuquio, Jalisco have a functional pair of shoes appropriate for high mountain living on uneven terrain, and a jacket or coat with which to withstand the freezing winter temperatures characteristic of the high mountains. In addition, the municipal government provided funds for the improvement of the road that extends from Cuquio to Rancho Nuevo. The improvement has benefitted Rancho Nuevo and other village residents by providing them easier access to the town of Cuquio. 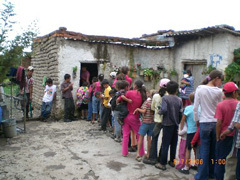 Additionally, the municipal government of Cuquio has built a junior high school in the village of El Terrero; within walking distance from the village of Los Sauces de Perez. In sum, in 2011, the children of two more impoverished villages now have access to education beyond elementary school and all school supplies to achieve academic success. The Center for Farmworker Families currently has several projects in progress that are designed to improve the lives of farm family members, both financially and educationally. Improved lives will allow these family members to stay at home with their families in Mexico and forego the unwelcome prospect of undocumented immigration to the United States.